The Freelancer.com marketplace now stands at over 19 million users globally. It is the largest resource for work in history and it continues to scale every day. While this is fantastic news for anyone looking for work, it also brings with it a lot of competition among all the job seekers. Just like traditional job interviews or pitches for work, a freelancer must do everything to stand out and be picked by the potential employer. Up-skilling, continuous learning and development, and qualification exams are some ways to ensure that you as a freelancer will win the work you bid for. However, the actually bidding process itself is a vastly critical aspect of winning work. Also consider the fact that each employer is as different as each freelancer is, therefore no 'magic formula' exists to ensure a successful bid. 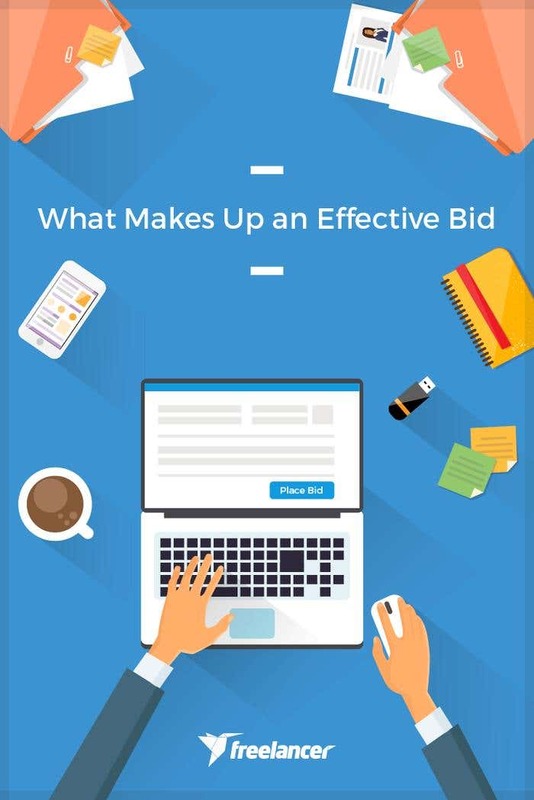 So what makes up an effective bid? Find out the answers below with numerous steps you can take to make your bid as effective as possible. It may seem like an obvious statement, but concentrate on winning work that you believe you will excel at. You should have the skills and attributes relevant to the project you’re bidding on. Freelancer.com offers skills tests, and as a freelancer you can use these to up-skill yourself. The quality of freelancers is always increasing, so your skills should be too. You do not have to undercut your competition. A common misconception is that the lowest bid wins the project. Not true at all. In fact, 47% of projects on Freelancer.com are awarded to the median or higher bidder. Employers look for quality, experience, ratings, positive feedback, re-hire rates, and communication abilities just as much as the price. An employer needs confidence that you are the right freelancer for the job. Prove it by composing a great proposal. Your bid proposal is a reflection of your future work. Provide as much information about yourself, your abilities, and your previous work as possible. More importantly, ensure that your proposal reflects what the employer is looking for. State exactly what you will provide and how long it will take for you to deliver. Do not be vague as the employer needs to know exactly what you can and will do. Every bid can be sponsored or highlighted. Sponsored bids are 70-100 times more likely to be awarded and will be the first bid the employer sees. It will also help if you understand how bids are ranked and why is it important to you. Read about our bid ranking guide here. Proofread your bid. Make your bid free of spelling mistakes and grammatical errors so it can have better chances of being awarded. If a potential employer sends you a private message, respond promptly! Effective and quick communication during the bidding process reflects on communication once the work has been won. Also most employers award their projects within 24 hours of posting so do everything you can to keep yourself available for questions. Install the Freelancer mobile app and stay in touch with employers on the go. Here you can also discover new projects and even bid on these projects wherever you may be. Moreover, should an employer message you, it means they are interested in hiring you. Close that bid! The world of work is competitive. Freelancer.com provides opportunity on a global scale and all freelancers must do everything they can to ensure this opportunity is awarded to them. We hope the above tips can help you to stand out from the crowd and be a strong start to a long and successful freelancing career. Joe Griston is the Director of People & Talent at Freelancer.com. He has sourced, architected and scaled world-class teams for this tech company that is disrupting the planet. Joe has recently returned to London from Sydney to drive the growth of Freelancer.com across Europe.